Here you will find "ready to go" comprehension exercises for you to use with your class (scroll to bottom of page and select). These kits feature comprehension tests, cross words/word puzzles, art and craft ideas as well as classroom presentation suggestions. More classroom activities and kits will be added over time. SUMMER HOLIDAYS ARE THE TIME FOR FUN! SEEKING YEAR END PLAY OR SHOW TIME IDEAS FOR SUMMER CAMP WORKSHOPS? We've been working with a great group of kids who have been learning all about the Borneo Rainforest. We've written stories and plays based on different aspects and threats facing the people and animals that live in our precious rainforest. For our year end show to the children's parents, we selected one of the stories created during our "rainforest adventure workshop". It was a lot of fun to share with funny dialogue, we featured music from Dave Bowie, Wings and Madonna as well as a finale dance routine! If you'd like to also use our material, you can download The Clever Snake play and also the "rainforest debate" we used as part of a special show. The file can be downloaded from this page - scroll to the bottom to file the file name and click to receive the file. In fact, we were delighted to hear from Stephanie Moreland, an English teacher at College Notre Dame des Collines in Rive de Gier, France, who has been using our Radio Ron's Postcards from Borneo series with her class of students in the "5eme" year. Stephanie's class comprises children aged 11-12 years old who are learning English as a second language. She challenged her students to write a rainforest themed play and invited Sandra Arthur to be a judge to select the winner! The prize for the winning group of student was to have their story illustrated and also created as an audio recorded book. or watch the video/YouTube image below. Stephanie found Radio Ron's Postcards from Borneo a useful book to stimulate student interest and help her motivate and improve all her student's written and spoken English. Over the past month we have had students who have been learning about the world's rainforests - their roles and risks. They have invented new animals; researched real animals and presented them to the class. They have played, "Guess my animal" where they give clues and others have to guess their secret animal; written and designed "postcards from Borneo" and created a variety of rainforest adventure stories. One fun activity we included was getting the students to perform like an advertising agency. They had to present their ideas for a poster and adverting campaign based on the theme "Save our Rainforests". We then voted on the best campaign. Applying real life examples really helped the students understand the value of creative writing! It really was a lot of fun and made learning easy! The project required listening and comprehension skills. They had to discuss and ask questions as well as complete a quiz to confirm their comprehension. They had to research and create clues and stories. They had to use strong verbal skills to present and persuade their viewpoint and finally they all had to read extracts from an adventure story. It's been a great project that has given the children something interesting to learn about whilst at the same time giving the chance to use their English language knowledge. We hope you might be motivate to do the same with your children or students! THEATRE, SONGS AND DANCE are the best recipe to excite children to love learning. We've been working with a young group of children to help them learn English as a second language. They've loved the "Radio Ron Postcards from Borneo series" and enjoyed recommended songs we feel match and complement the story line, such as Row, Row your boat. For a special year end play, we incorporated a well known nursery song, "The Wheels of the Bus", together with the fun "Super Hero" song that is featured in Richard Graham's GENKI English online learning course. It was written to feature only six children, but you could easily expand the number of passengers and add more simple dialogue. Play Summary: Note: Story spoiler! A group of passengers are taking a trip to Magic Land. They all buy a bus ticket for the journey but before they can depart each passenger remembers that they have forgotten something in the waiting room. Each person retrieves their forgotten item (piece of clothing etc) as the passengers all become frustrated at the delay. Eventually they are ready to leave and then the driver calls out that has forgotten the keys! The journey commences and the people on the bus all sing happily the Wheels of the Bus song. Once at their destination the drives waves his magic key and everyone becomes a "Super Hero". The play closes with a fun song and dance - as featured on Richard Graham's Genki English website. The children helped to make all the scenery and props required for example a large cardboard bus, luggage, bus tickets, signs and so forth. If you are stuck on what to do for your year end play (for 5-7 year olds) then why not download our play, The Magic Bus Ride (scroll to the bottom of this page). The kids love - especially sitting on the bus! If you'd like to learn more about GENKI English material link here. Enter our crazy book giveaway and stand a chance to win one of our books or audio ebook. All you have to do is share "how you make reading fun" and LIKE our FACEBOOK page. Go to the link above to enter - Good luck! Contest runs from 13 November - 6 December 2013. If you haven't bought our fun audio eBook: Crocodile attack (with music and fun narration) you can get a peek and share the story with your kids by checking out STORYCUB - a new online video story service. Link here to watch Crocodile Attack (Only story, does not include games, puzzles and fact file featured at end of book). Loved by children, trusted by parents, and applauded by educators. StoryCub's mission is to get kids excited about reading by providing entertaining, multi-format video stories. We connect parents and their children with authors and publishers. Built for today’s digital families; preschool and kindergarten educators also rely on StoryCub for the discovery of great books. Watch video versions of kids picture books that are both educational and entertaining. View on Smartphones, Tablets and other digital devices. StoryCub is always ready when you are. Make sure you grab the free StoryCub app and join us on Facebook or Twitter. Note to Parents: READ WITH YOUR KIDS! Here is a fun idea for parents or teachers to try out, with their children, during the dark winter months. To encourage your child to read, why not help them create their own personalised bookmark. There are many designs and shapes to discover but we love making these unusual origami bookmarks. Origami encourages them to appreciate work well done. Origami improves their abstract thought. Origami teaches them a new symbolic language. Origami is an excellent cross-curricular aid. Just about any subject can be taught using origami. As it is near Halloween, here is the link to a FREE template that features a witch. However, you can create any image : an orangutan, a pirate, a monster, a cat etc. So get your creative hat on and starting creating your own bookmark. Watch this video link (above) to learn how to fold and create these special corner shaped bookmarks. Download one of our latest classroom activity kits - a Rainforest Project Activity kit (see below). This kit will get your children interested in nature; it will unleash their creativity as their create THEIR own rainforest animal and write their own adventure story PLUS they will have fun playing detective in the "Guess Who" exercise. 2. Write an adventure story - based on their animal. 3. Develop questions or a riddle to reveal a REAL rainforest animal (that you assign). Additional items could be for a classroom mural and drawings to be created. For your advance reading group, our junior fiction, Cpl Ron's Borneo Warrior Rescue, could make interesting reading. Approved as a fun adventure book for boys and eco-warriors (by a teacher/librarian group in USA) the fast paced action story will lead them through the rainforest, via the eyes of an RAF radio man. Each chapter includes "facts and stats" about the Borneo Rainforest that should wet the appetite for the reader to seek our more information. Wherever you are in the world - Happy Father's Day! Link here to learn how one motivated teacher has used our Radio Ron's Postcards from Borneo series to enhance her English classes with French students. Read Stephanie Moreland's interview here. Also learn more about the competition her class entered with Sandra Arthur Books and find out which entries won our great prizes: An autographed copy of "Corporal Ron's Borneo Warrior Rescue" as well as our audio ebook: Radio Ron's Postcards from Borneo: Crocodile Attack. Stephanie followed our six week Classroom activity kit that offers lots of easy to follow exercises. We also supplied a copy of our special Borneo slide presentation that includes a fun art project, songs as well as general Borneo knowledge to share with young students. We also have a comprehension test (see in files below) to check that your students are listening and understanding your presentation. If you would like a copy of these slides, simply drop us a line via email. Stephanie and author,Sandra Arthur, challenged the students to write a play based on Radio Ron's adventures. The winners of the Creative Writing Award were students: Diana, Imene and Sabrina. Their prize was to have their play professionally recorded and illustrated. All children love to be praised and receive recognition for their reading achievements. We have produced the following certificate that you can print off (download from file at bottom of this screen below: Literary Award Certificate) and present to those children who have read our Radio Ron's Postcards from Borneo series. With Crocodile Attack now being available as an audio book (for the ipad) there should be no excuse to listen, learn and read! There is also an award for those children that love poetry and have been successful to read aloud our popular rhyming story, The Golden Gondola. Again, you can download the file from this page- please scroll to the bottom. Download and print off our Radio Ron's Crossword Challenge. This document demands that your students read Crocodile Attack and then use their skill to complete the crossword puzzle. Download from file below: Radio Ron's word challenge. Golden Gondola is now available. You will find the document at the bottom of this page. The Golden Gondola is available in English and French and also in a special dual language ebook and paperback book. Our new witty and charming story with colourful illustrations by Will Stevens will delight all children 4-9 years age group. This read aloud book offers lots of fun, word builders and the chance to learn more about music and geography. Remember to use the music links on this site to enhance the reading experience with your children. Sales of this book support The Children's Home, Nepal. We occasionally host and support special storytelling workshops. If you would like to invite the author (or illustrator) to your reading workshop please make contact to discuss details. Here are some photographs taken at a special Golden Gondola Workshop hosted in France. Special "Radio Ron Classroom activity kits" to assist educators to use our material in their classrooms or for special storytelling/workshop events are available. We have a six week agenda you can follow or there are individual exercises for early readers or advance readers. This web page also features art and craft ideas as well as fun items such as badges and bookmarks. Bookmarks, Badges and stuff to make! For our early learner series, Radio Ron's Postcards from Borneo, we recently ran a series of workshops based on jungle adventure themes. One great idea was to create raincups. These are easy to make, so we want to share with you how to do this! Take two empty plastic cups/pots and paint them - we choose green and blue. Once the paint was dry we filled the cups with rice and crunched up small pieces of paper. We then placed a second pot on top and sealed the two cups together with tape. We decorated the cups with rainforest stickers (birds, frogs, etc). It was that simple. We used the raincups as part of our sound affects, when reading Radio Ron's Borneo stories - we moved the cups very slowly to sound like to soft rain. We also used them to accompany our singing sessions during the storytelling event - for example, Row, row, row your boat! Corporal Ron's Borneo Bookmark - just print! Use the attached files to print off your own Borneo Bookmark! Remember to use thin card in your printer. Questions: How many teeth does the crocodile have? How many spots are on the butterflies? Copy and print the design to practice colours: Colour one butterfly in orange and brown, one butterfly in red and yellow and one butterfly in pink and blue. Colour one crocodile green, one crocodile brown and one crocodile blue. Colour one palm tree green and brown, one palm tree blue and red and one palm green purple and grey. Use the attached pdf file to print off and make your own Venice Escape bookmarks for yourself and friends. For greater durability, load good quality card into your printer and print off one side (file 1). Then, you decide if you would like to have print on both sides. If yes, turn over your printed card and re-load into printer so you can print on reverse side. Select file 2 and print. To make a truly professional job, arrange to laminate your bookmark. - flying golden gondola with Magic Marco and Maria illustration. Created by British artist, Will Stevens. Developed for our Venice Escape Discovery Morning. Print off design onto adhesive paper to apply on signage, posters, "Venice Escape" party invites, school books. Use your imagination and please share your ideas in our comment box below. Don't forgot to tell your friends about the fun music links that can be found on this site, to accompany the story. Artwork for badges, blazers, caps - you decide! Venice Escape illustration/artwork - provided by the British artist: Will Stevens. Print off on adhesive paper to make stickers to place on files, paper bags etc. Obtain a basic Columbina (half face) mask that can be bought at craft shops. To help speed up drying you can use a hairdryer. Check that the paint is dry before adding final decoration. To finish add ribbon, glitter, jewels and feathers. inspired by Crocodile Attack: Radio Ron's Postcards from Borneo. Illustration by Lisa Williams. You may print off the file from document file below. For classroom or private use only. All rights reserved. FREE puzzle for you to print out and share (for educational purposes only) Copyright material. Find file in directory below. Your child will love the challenge. Ken Stiles, author of "The Educational Benefits of mazes" explains why these type of puzzles are so helpful. al accomplishment that can be derived from effectively solving a maze puzzle. Part of the reason for this is because mazes require analytical skill that other puzzles often lack. This instills in the person working the maze with disciplined thinking and a strategic plan. A disciplined mind is highly valuable and this is one of the most important educational benefits that mazes provide. After all, such traits can be applied to any field and endeavor. Ultimately, solving a maze puzzle is about expanding the capacity of the mind. This in and of itself can provide tremendous broad-based educational benefits and this makes proficiency with maze puzzles an envious skill." Select our file below (Orangutan Rescue Poster) and print off this colourful poster for your classroom or child's bedroom. Our Radio Ron's Postcards from Borneo Series has a fun Classroom activity kit to help you maximise the reading opportunities for your students. - Develop writing skills - write a postcard to Radio Ron! - Create your own stories about Radio Ron. - Explore and learn more about the plight of endangered orangutans. •Learning to read with Radio Ron:Class projects and suggestions on how to make reading fun. Plus songs and puzzles. Please download this poster and display in a suitable location (library/notice board). You will find this poster as a free download in our files below. Please help us by spreading the word and sharing this poster and link. This ebook with narration and music, clear text to read aloud, and colourful illustrations to entertain. Makes a perfect book to download to ipad or iphone for travel. Includes some simple puzzles and environmental information on orangutans for parents to help inform their kids. Do you want your children to come running when it's storytime? … the first step to literacy is simply being immersed, through conversation and storytelling, in a reading environment; the second is to read a lot and often.” Susan Engel, senior lecturer in psychology and the director of the teaching program at Williams College. This is something I really believe is true and have set out to not only write books for kids that are fun but also have been leading a number of storytelling workshops. Over the past few weeks I have been sharing, on my FaceBook site, some of my reading aloud tips when sharing my books with small children. Therefore, having run a number of interactive “story telling workshops” to a wide range of international children, I hope you can now benefit by using some of these techniques with your children or class. When reading to children, add a third dimension to the activity. Example, when reading our “The Golden Gondola”, we played music and sampled food that was discovered in the story in China, Iran and Japan as well as Italy. We did this at a recent “reading” and not only were the kids excited, many rushed home and wanted to cook! They had to dig out recipes and this in turn provided them with further opportunities to read. When reading aloud SLOW DOWN your speech. This is key. When you are nervous it is normal to speak quickly, so ensure you prepare before your storytelling session. Sounds silly, but even if you are reading bedtime stories, take time to read the book ahead of sharing. The key for “public speaking” is to practice beforehand and if possible try recording and playing back your voice. You want to aim at a reading speed of around 150 words per minute – so by timing you can gauge your speed! At first, you may think this is far too slow, but remember, the children are hearing the story for the first time. They need time to listen and understand. You’ll appreciate how much better it is to not only speak slowly, but also loudly with plenty of pauses. A great tip is when you see a full stop, pause, take a big breath and count to 2 (in your head) and for a comma count to 1. This allows you to keep your reading slow and also children have time to build up a mental picture of the scene you are describing. Your voice level is also important to ensure that everyone can hear what you are saying. You can also use volume to add tension. For example, use your voice as “whisper” when there is danger in the dialogue, shout when there is anger etc. Bring the story alive – use different voices for each person/thing speaking in the story. In our Radio Ron Audio ebook, we used a funny British Voice for Radio Ron and Canadian / American voices for the Dayaks! However, be careful what accents or voices you use. You will need to practice and ensure you can sustain consistency and fluency. You will need one “voice” for the narrator and perhaps create others for key characters. And don’t forget to share the illustrations – there is no need to hurry. When reading to young children (who generally can’t sit still!) let them have something to do with their hands. It could be a string of worry beads, or consider handing out paper and pens. Let them sketch out ideas or just scribble, as you read! Alternatively, ensure you give everyone the chance to move. For example, before reading any animal based story, you can invite the children to sound or move like their favourite animal. If you are reading to just one child, allow them to look at the book and study the pictures after the story. This will allow them time to review and ask questions. When reading aloud to children, remember to keep them engaged. Before you turn the page ask them what do they think will happen next. Discuss each illustration and ensure as many children as possible have the opportunity to respond and contribute. Make a list of questions that you can use if you notice “boredom” setting in! 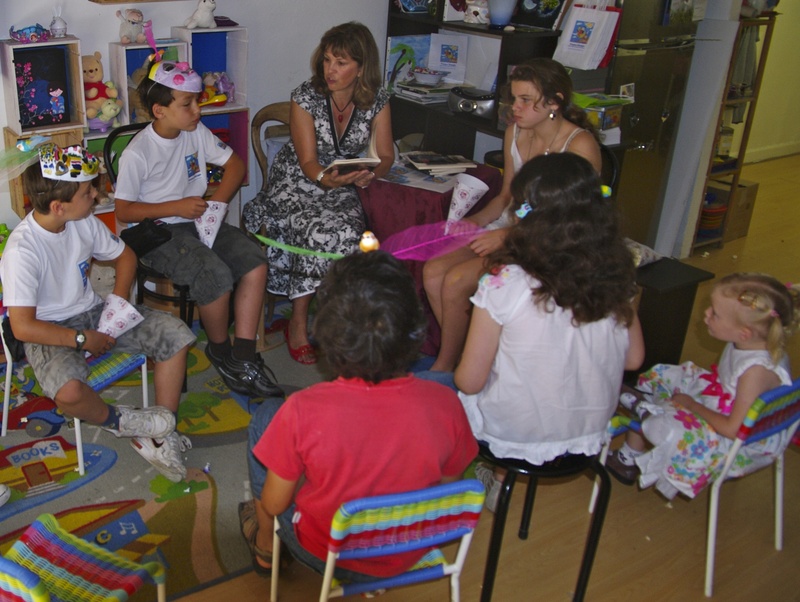 If reading aloud to a group of children – set the mood with music. 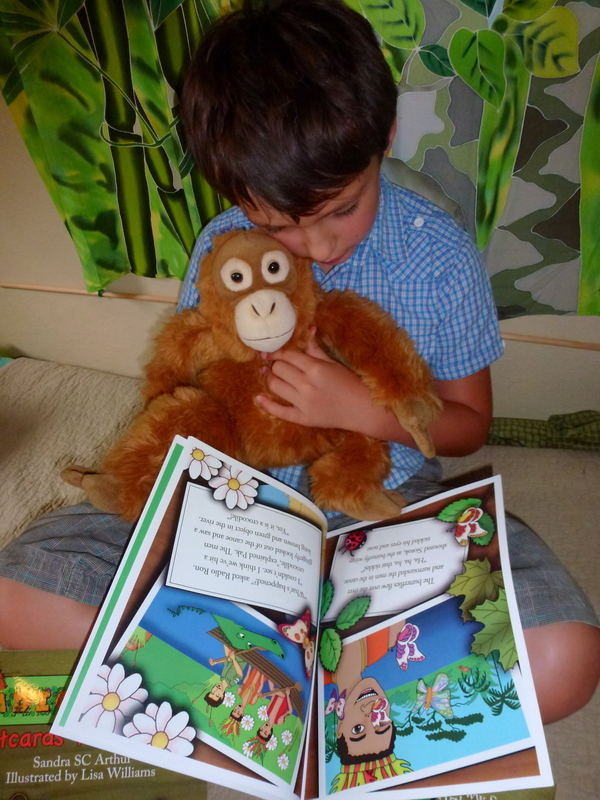 Example, when reading one of our Borneo themed books play some traditional Borneo inspired music or jungle noises as children settle down to hear the story. Example: Listen to the wonderful sape being played by top musician, Jerry Kamit. Use some of the links of our Music Link page to feature when reading The Golden Gondola. Make it fun. Not only try to make your reading as entertaining as possible, consider what other activities you can do that tie into the theme after the storytelling session. This could be singing a song, drawing a picture, creating a puppet show or performing a dance. Use technology to secure extra interest. You can project electronic books onto the classroom wall. Use a laser light to highlight words that you are reading. If you have internet connection, if appropriate, link to Google earth or similar sites to show the location of your story. Likewise, consider to review other suitable web sites. For example, show a picture of the book’s author and learn more about the writer of the book you are sharing. Listen to music that might be related to the story and so forth. Allow different children to choose their favourite book for each storytelling session. The chosen child will be extremely happy and proud of her choice and other children will be keen to be selected to find fun books for future readings. What are your favourite reading tips? We’d love to hear from you and share with others. 2. Row, row , row the boat. 4. One finger, one thumb. 5. It's raining, it's pouring. 6. If you're happy and you know it clap your hands. 7. The Wheels of the bus. Let us know what songs your class enjoy singing! You can download for FREE the files referred to on this page from the table below.